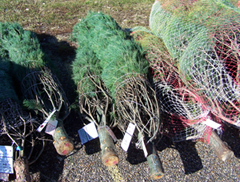 Iowa grown Christmas trees before the holiday. Haines says most communities will pick up the tree at the curb for mulching or composting. But, she says you can also turn it into a natural birdfeeder in your yard. “Simply stand it up outside near a window and hang edible ornaments on it to attract birds,” Haines said. “Pinecones covered with peanut butter and birdseed bring lots of feathered friends to the garden.” Another recycling option would involve giving the tree to a local fishing enthusiast or farmer with a pond. Haines says sinking the tree into a pond or lake helps improve fish habitat. You could also cut up the tree for your own use as mulch around the yard. “A blanket of evergreen boughs cut from the tree is a great insulation over tender perennials or other newly planted perennials,” Haines said. An evergreen tree should not be used as firewood. Burning the tree can contribute to creosote buildup in a chimney.